Rum Barrel Prepares to Host 2nd Annual Pirates Bash - Official Fantasy Fest Event Check back soon for more details of this wild and voracious official Fantasy Fest event! PAST EVENTS Rum Barrel Hosts 1st Annual Pirates Bash - Official Fantasy Fest Event Key Westâ€™s resident pirate and rum experts --- Pirate Soul Museum and Rum Barrel Restaurant & Bar --- teamed up to host the 1st Annual Pirates Bash Official Fantasy Fest Party on October 26th, 2007. Hundreds of swashbuckling pirates and wenches converged on the Rum Barrel for a chance to win $2000 in cash for the best pirate, best wench and the bilge rat prize, awarded for the most outrageous costume! Congratulations to the following 2007 Pirates Bash winners: - Best Pirate - Rusty Hill - Best Wench - Jennine Hill - Bilge Rat Award - Joe Gallagher Thank you to all our Piratical guests and costume participants! A special thanks to our primary event sponsor Bacardi. Special thanks also to Fairvilla for providing the costume competition trophies and for providing our guests with the best pirate costumes in Key West! Visit the Photos page for pictures from the 1st Annual Pirates Bash! www.piratesoul.com/rumbarrel/photos The Rum Barrel crew has already begun preparations for the 2nd Annual Pirates Bash Official Fantasy Fest Party in 2008... We hope to see everyone again next year! Home of the Southernmost Eagles Club Benefitting Local Charities The Rum Barrel is proud to host the 2nd season of the Southernmost Eagles Club! Thanks to all of our members and crew for an amazing inaugural '06 season where we tallied more than 500 members and distributed over $5k to local charities including Big Brothers Big Sisters, The American Cancer Society and the creation of a Pirate Soul Scholarship fund at Key West High School. The 2007 season has begun and we are proud to again host the Southermost Eagles Club during every Eagles game this season. Sign-up at the Barrel during all Eagles games and receive the 2007 club t-shirt ---- "Absolut Eagles Fan." The Southernmost Eagles Club is proud to be sponsored by Future Brands. $5 Absolut, Jim Beam, Cruzan and Sauza drinks during every NFL game this season as well as College Football Saturdays. The Rum Barrel presents EVERY NFL game on 10 flatscreen televisions. Catch every NFL game this season at the Barrel! View the video of our '07 new Eagles Flag raising moments before our opening game kickoff! http://www.youtube.com/watch?v=WYRFmfDeA9g Rum Barrel Hosts Key West Songwriters' Festival Show on May 1, 2008 The Rum Barrel hosted the opening night of the 2008 Key West Songwriters' Festival for the second year in a row! Visit www.kwswf.com for more festival information including musician profiles, photos, live music feeds. Checkout our 2008 songwriter's festival photo gallery for pictures from this year's successful event at the Barrel. Rum Barrel Gift Cards Now Available Give the gift of Great Grub and Grog this holiday season! Buy your Rum Barrel gift card today! 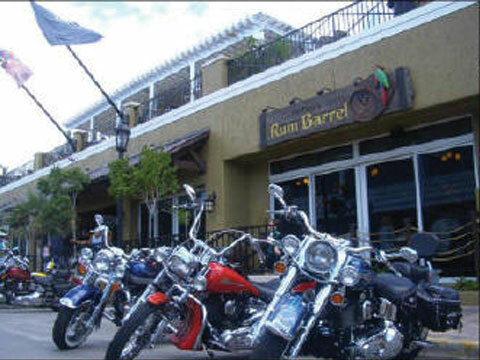 To purchase gift cards, call 305.292.7862 or visit the Rum Barrel at 528 Front St. in Key West. Rum Barrel Hosts Pat Croce's Book Release Party for his New Book Pirate Soul: A Swashbuckling Journey through the Golden Age of Pirates During the Golden Age of piracy, from 1690-1730, thousands of rogues and cutthroats sailed the seas in search of ships to attack and treasures to plunder. Their lives and lifestyle are portrayed in the authoritative Pirate Soul: A Swashbuckling Journey through the Golden Age of Pirates, written by bestselling author, motivational speaker and passionate pirate historian Pat Croce. On Drink Like a Pirate Day on October 19th, the buccaneering crew of Croceâ€™s Rum Barrel Restaurant/Bar and Pirate Soul Museum hosted a book release party for the book. Swashbucklers of all sorts joined Pat and the Pirate Soul and Rum Barrel crews to celebrate the book release by hoisting a mug of grog and partying in true piratical fashion.